Xoar PJI 3-blade Beechwood Propeller is made of the best quality German Beechwood for excellent physical property in elongation, breakpoint and distortion rate ensure by its heating process. 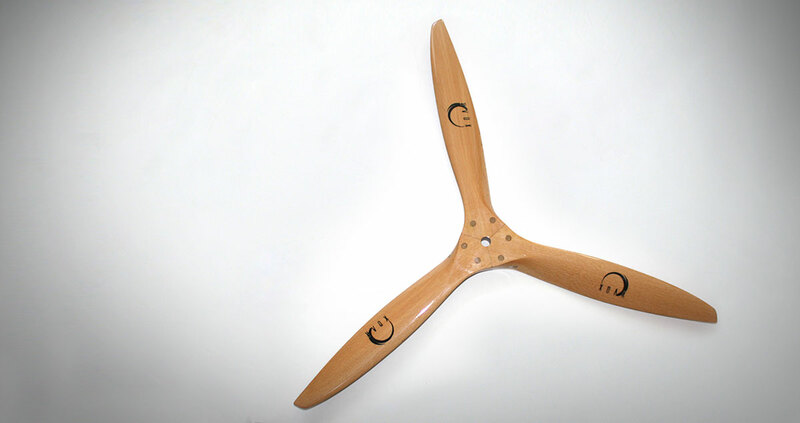 Xoar 3 Blade RC Propeller contains an aluminum reinforcing hub and studs that secure the 3 wood blades in place. It's light weight and strong and offers a quiet and smooth flying experience for your Gasoline RC Airplanes. After approving the design in digital imaging, Xoar PJI 3 Blade Propeller will be transferred into CNC manufacturing program. After CNC, the semi-finished prop comes into shape. The each prop is manually finished to reach perfect surface smoothness and balance which makes Xoar Prop stand out from its competition. During the coating process, 2 layers of primer coating and 2 layers of glossy protective coating are applied in order to prevent corrosion. Once again, each of the Xoar prop is manually rebalanced. Spot check was performed to each batch by randomly selecting a number of props and put on actual engine for rotating balance and quietness check. Xoar PJI Props come in a full range of specs from 10" to 35" diameters and a well variety of pitch to satisfy all kinds of aircraft and engine specs and desired flight performance.